I awoke Christmas morning to find this in my stocking. Santa knows me well. What would I have gotten instead of coal? A can of Boxer for a few misdemeanors. Coconut Malibu, but only for a criminal offence. Dead Frog brewery from Aldergrove, BC released "Christmas Beeracle" just in time for Christmas, donating a portion of the proceeds to the BC Children's Hospital. The amber ale is brewed with cinnamon, nutmeg, and ginger to add a hint of spice. The spice flavors are not particularly strong, though I found similarities to Big Rock Winter Spice, a brew with more malty sweetness. Big Rock may have likely to make way for their Scottish Heavy Ale (also a great beer, especially if you like Innis and Gunn), as I could not find Winter Spice anywhere this year. 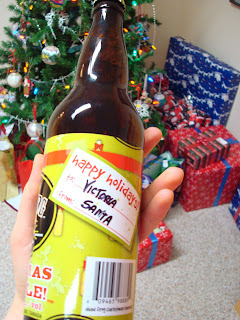 I drank this beer with Christmas dinner, though it would also pair well with richer red meats or foods prepared with similar spices. It's not an overpoweringly sweet beer, so it pairs better with more savory dishes. Think roasted lamb with nutmeg, Moroccan tagines with cinnamon, or carrot and squash soups with ginger. Alley Kat also released a Christmas themed beer in time for the holidays. Although both holiday themed beers sold , you may be able to find a few left on the shelf. Sherbrooke Liquor in Edmonton is probably your best bet, though Liquid Harvest at the Enjoy Centre in St. Albert may also have a bottle or two.